Dan had Friday off since he's working today. We headed over to his father's in Danville and hung out in the air conditioned house since it was a lovely 107*. Worked my triceps at Costco by pushing one of his families two shopping carts. I had way too much fun getting all the free samples since we didn't have much of a lunch. Played a pretty decent game of wii golf. They kept making fun of me because "a small breeze would come up" and keep me from swinging. Really, I just kept taking my finger off the A button by accident. Had an impromptu birthday party with delicious fruit tart dessert. Was such a fun send off. Dan's wonderful friends from Iowa came to visit us Saturday night. 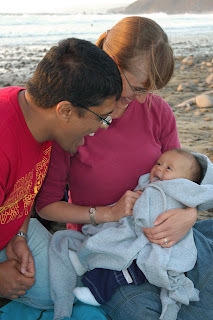 We met George, Megan, and their 5 month son, Steven at Linda Mar Beach. We had such a great time playing but it got cold and windy after the sun went down. Naturally, we moved the party back to my house and got a few good photos. I have to say this is one of my most favorite photos. 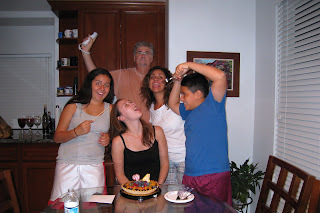 In fact, probably my favorite family portrait I've taken. Celebrated my Grandfather's, Mom's, McKenna's, and my birthday at Vivace in Belmont. 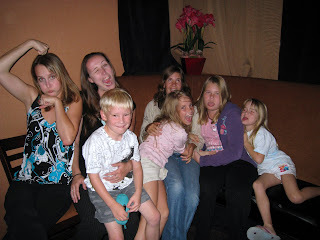 A bunch of the cousins thought it would be fun to make silly faces. Hope everyone is having a great day celebrating Labor day! Sounds like you all had such a blast! Love that family portrait you took! Have a safe trip! I really can't wait to see your pics! yummmm...fruit tart...now im craving one.